PhD (Economics) – Jawaharlal Nehru University, New Delhi, 2004. Phil (Applied Economics); Jawaharlal Nehru University, New Delhi, 1994. A (Economics); Mahatma Gandhi University, Kerala, 1992. 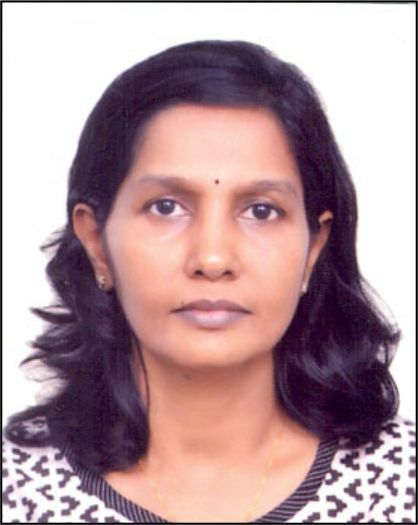 She was Associate Fellow & Coordinator, Centre for Gender and Labour at the V.V. Giri National Labour Institute, NOIDA during 1998-2006. Her research interests are labour and employment issues of women, domestic workers, labour migration and gender statistics and data gaps. (co-editor with S. Irudaya Rajan) Migration, Gender and Care Economy, Routledge, London (forthcoming, 2018). Working at Others Homes: The Specifics and Challenges of Paid Domestic Work, (ed. ), Tulika Books, New Delhi (forthcoming, 2018). Institutional Choice in Irrigation: A study of distribution in a canal command in Kerala (2009), Concept Publishing Company, New Delhi. Decent Work: A Handbook (with Sasikumar and Babu P. Remesh), V.V. Giri National Labour Institute, NOIDA, 2008. · Special Issue on Domestic Work, Economic and Political Weekly, Review of Women Studies, Vol – XLVIII No. 43, October 26, 2013. (with Dimple Tresa Abraham) MGNREGA: Asset Creation and Rural Development: An Evaluation of Category B Assets in Selected States, Centre for Women’s Development Studies, Mimeo, New Delhi, 2018. Approaching Data Sources: A Gender Lens, Centre for Women’s Development Studies, Mimeo, New Delhi, 2015. (with Indu Agnihotri and Indrani Mazumdar) Gender and Migration: Negotiating Rights – A Women’s Movement Perspective, Key Findings CWDS, 2012. (with Indrani Mazumdar), Conditions and Needs of Women Workers in Delhi, Delhi Commission of Women & Centre for Women’s Development Studies, Mimeo, New Delhi, 2009. Minimum wage setting practices in domestic work : an inter -state analysis , Conditions of work and employment series – No. 66, International Labour Office, Inclusive Labour Markets, Labour Relations and Working Conditions Branch.- Geneva: ILO, 2015. Inequalities Reinforced? Social Groups, Gender and Employment, Occasional Paper No.59, 2013. (with Indrani Mazumdar) Gender Dimensions: Employment Trends in India 1993-94 to 2009-10, Occasional Paper No. 56, Centre for Women’s Development Studies, New Delhi, 2011. ‘Women’s Work in the Post Reform Period: An exploration of macro data’, Occasional Paper No. 52, CWDS, New Delhi, 2008. The Language of Employment Contract: Paid Domestic work Practices and Relations, in Understanding Labour Market Institutions, Processes and Policies in the Globalising India, Shyam Sundar, ed, Palgrave Macmillan, (forthcoming). Social Groups, Gender and Employment in “Women in the Worlds of Labour: Interdisciplinary and Intersectional Perspectives, Orient Blackswan (forthcoming). (co-author) Pluralization of Families in ‘Rethinking Society for the 21st Century’ edited by International Panel on Social Progress (IPSP), Cambridge University Press, (forthcoming). Exploring Paid and Unpaid Work Dichotomy in a Labour-Care Perspective in Labouring Women: Issues and Challenges in Contemporary India, Orient Black Swan, 2018 (forthcoming). Tracking Gender Inequality through Statistics, Status and Gaps in Social Statistics in India, Primus Books, 2018 (forthcoming). Family Policy in India: Contradictions, Continuities and Change, (with Rajni Palriwala) in Guðný Björk Eydal and Tine Rostgaard (ed.) Handbook on Child and Family Policy, Edward Elgar Publishing, 2018. National Policy for Women 2016, Kurukshetra (Special issue on Empowering Women), Volume 66, No.3, January 2018. “Women’s Employment: Hoping Against Hope”, Yojana, Special issue on Labour Welfare, April, 2017. Ensuring Gender Justice in Labour, Yojana (Special Issue on Labour with Dignity), Vol. 84, April, 2016. Employees’ State Insurance Scheme for Domestic Workers : Yet Another Mockery, Vol. 52, Issue No. 11, 18 March, 2017. Urban Housekeepers from tribal lands: Adivasi women migrants and domestic work on Delhi in Citizens First: Studies on Tribal, Adivasi and Indigenous Peoples of India, edited by Meena Radhakrishnan, Oxford India Studies in Contemporary Society, 2016. Persistent Inequalities and Deepened Burden of Work? An Analysis of Women’s Employment in Delhi, in Women Workers in Urban India, edited by Saraswati Raju and Santosh Jatrana, Cambridge University Press, London, 2015. Shifting Accountability? Reading the Budget from Women’s Perspective, Yojana (Special Issue on Union Budget 2015-16), Vol. 59, March (2015). “Confined to the Margins: Female Migrant Workers in Urban Areas” in India Migration Report 2015: Gender and Migration edited by S Irudaya Rajan, Routledge, India, 2015. Female Migrants in Paid Domestic Work, Yojana, Planning Commission, Volume 58, October 2014. Crisis in Female Employment: Analysis across Social Groups, Economic and Political Weekly, Vol – XLIX No. 47, November 22, 2014. Paid Domestic Work: Making Sense of the Jigsaw Puzzle, Economic and Political Weekly, Review of Women Studies, Vol – XLVIII, No. 43, October 26, 2013. Minimum Wages for Domestic Work: Mirroring Devalued Housework, Economic and Political Weekly, Review of Women Studies, Vol – XLVIII No. 43, October 26, 2013. (with Indrani Mazumdar and Indu Agnihotri) Migration and Gender in India; Economic and Political Weekly, Vol – XLVIII No. 10, March 09, 2013. (with Rajni Palriwala) Stratified Familialism: The Care Regime in India Through the Lens of Child care, in Seen, Heard and Counted: Rethinking Care in a Development Context edited by Shahra Razavi, Willey- Blackwell publishing Ltd. UK, 2012. (with Rajni Palriwala), Why the absence of Law? Domestic Workers in India, Canadian Journal of Women and the Law, Special Issue on Decent Work for Domestic Workers, Volume 23, No. 1, 2011. Gender, employment and poverty in rural India – Neglected Terrains, Report on Science and Technology in India, National Institute of Science, Technology and Development Studies, New Delhi, 2011. (with Rajni Palriwala) The Political and Social Economy of Care in India, in Shahra Razavi and Silke Staab (ed), Political and Social Economy of Care, Routledge, New York, 2011. Changing Dimensions of Women’s Work and Gender Inequality in the Post – Reform Period in K. Trivedi edited, The Globalisation Turbulence: Emerging Tensions in Indian Society, Rawat Publications, Jaipur , 2011. (with Rajni Palriwala), Stratified Familialism: The Care Regime in India through the Lens of Child Care, Development and Change, Volume 12, Number 4, July 2011. (with Indrani Mazumdar), Gender Dimensions: Employment Trends in India 1993-94 to 2009-10, , Economic and Political Weekly, October 22, 2011, Vol. XLVI, No.43. Self-Employment of Women: Preference or Compulsion? Social Change, Volume 40, No.2, 2010. (with Rajni Palriwala), Unpaid Care Work: Analysis of the Indian Time Use Data, in Debbie Buddlender ed. Time Use Studies and Care Work, Routledge, New York, 2010. (with Rajni Palriwala), Care practices and care bargains: Paid Domestic Workers and Anganwadi Workers in India, International Labour Review, International Labour Organisation, Vol. 149, No.4, 2010 December. Estimating Unpaid Care Work: Methodological Issues in Time Use Surveys, Review of Women’s Studies, Economic and Political Weekly, October 30, 2010, Vol. XLV, No.44. Report on Employment: A Bird’s Eye View or an Eyewash? Economic and Political Weekly, September 18, 2010, Vol. XLV, No.38. Women and Care Work: Alternatives from India, Special issue on ‘Sustaining Local Economies’, Development, Volume 53 No. 3, September 2010. Dynamics of Women’s Employment in the Era of Globalization: Signs of Segregation or Integration? in Women’s Situations and Women’s Studies: A South Asian Perspective, edited by Sanchari Roy Mukherjee, Sarat Book Distributor, Kolkata 2010. The Case for Social Policies on Care Work, In Search Of Economic Alternatives for Gender and Social Justice: Voices from India, edited By Christa Wichterich, Heinrich Boll Foundation, Wide, Brussels, Belgium, 2009. Changing Dimensions of Female Employment in India: Insights from NSSO Data, Labour and Development, Vol. 14-15, No.1& 2, June 2009. Rethinking Child care in the Changing socio-Economic and political Scenario, in Undoing our future: Report on the Status of Young Children in India, Forum for Creche and child care services, New Delhi, 2009. Contours of Domestic Service: Characteristics, Work Relations and Regulations, Indian Journal of Labour Economics, Vol.52, No. 3, 2009. `Feminisation or Segregation? Insights from a Disaggregate analysis of NSSO Data’ in Gender Issues in Development: Concerns for the 21st Century ed. Bhaswati Das and Vimal Khawas, Rawat Publications, 2009. `Changing Dimensions of Unemployment in India during the Post Reform Period’ in The Indian Economy since 1991: Economic Reforms and Performance, Edited by Prakash, B.A., Pearson Education, 2009. (co-authored with Babu P. Remesh), Gender Implications of Outsourced Work in the New Economy: A Case Study of Domestic Call Centres, The Indian Journal of Labour Economics, Volume 51, No. 4, Oct.-Dec. 2008. Regulating Domestic Work, Commentary, Economic and Political Weekly, Vol. 43, No. 37, September 13-19, 2008.